On Jan 27 I get my left shoulder operated on for rotator cuff repair, bone debridement and 3 muscle tears repaired. At 66 I guess it's just accumulated wear & tear that I can no longer put off repairing. I may look 45 but my body is beginnin' to say I ain't. Anyway I've paid my fee for yet another Grand Canyon backpacking trip on April 21st. I'll be carrying a (kinda)light pack of around 32 lbs. including 7 days' food & 2 liters of water on the 1st day. Mercifully it gets lighter each day, as we all know. I think I'll be OK. So does my orthopedic surgeon after I explained that 80% of the weight will be on my padded hip belt. Anyone have a similar operation? How did it feel when you hefted a full pack? TENT> TarpTet Moment at 28 oz. Th-th-that's it Folks Any suggestions? No PLB? What will you do if the water is too salty? Will it be cold enough for the Megalite? And I sold my UL 60 to finance a Gossamer Gear Mariposa, really happy with that move. The trowel. Do you really need it? Between the trekking pole and rocks you can find, can you still dig a hole, even if a bit slower? Are you going to camp at any sites where there is an outhouse? Hey, sun dry the poo and burn it for fuel. The tent stake "trowel" is what I use. 0.9 oz., and it can do double duty as a spare tent stake. If I didn't have to bury my dog's leavings as well as mine, I might go without. Since it's also used for my dog, he gets to carry it! 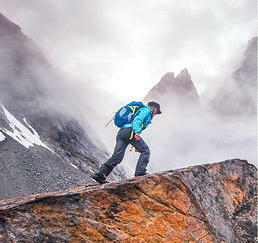 The one item on which you could save significant weight is your pack. My shoulders are very pressure-sensitive and I cannot use a pack without load lifters--which is why I avoid Gossamer Gear packs. I would think that so soon after surgery, you'd be in a similar situation. You might look at the Six Moon Designs packs, with the "optional" (mandatory, IMHO, especially for the load lifters to work) aluminum stays--I believe the newer Starlight is 30 oz. (I have their now-discontinued Comet.) SMD packs are on sale right now! You'd save a pound and a half with the Starlight. ULA is also a good source, although heavier. Their Catalyst would save you only half a pound, but it's an excellent pack. Hopefully you're bringing some kind of light? Or did I miss it? The other place you could save some weight is your sleeping pad. However, you might want to wait until several weeks after your surgery to decide that one. You might need an air pad for your shoulder to be comfortable (blow it up only about halfway so it has "give" to it). There's always the NeoAir--I didn't like it, but if you aren't already using a 2.5" thick air pad, the NeoAir would be more comfortable than what you have. Minor stuff: Tooth powder instead of paste (I use baking soda, dentist recommended). Skip the soap since you have sanitizer. Platypus water containers are the lightest and stow the most compactly when empty. I've been told you should have 1 gallon water capacity in the GC? Two 2+L Platy bottles weigh 2.8 oz. Consider just 1 set of extra socks, since they'll dry really fast there. I love my 10 year-old Thermarest Lite full length pad. Last year I even ret'd. a new Neo-Air to REI B/C my pad felt better. I DO carry a tiny coin battery headlamp. at first I was concerned it's tiny battery would not last but one battery lasts over one season at my rate of use. The REI Cruise UL 60 does have lift straps. And tough enuf but still light enough for the bushwhacking I sometimes do. Hate to have to replace it just yet.I absolutely must have an internal stay (not "framesheet") pack W/ load lifters. Comfort is often found in other places than merely cutting down weight. Maybe I'll just take Camp Suds and leave the hand sanitizer at home. I had a shoulder surgery (to repair torn labrum) three years ago. I had left shoulder chondroplasty and subacromial decompression in July. In September I Backpacked for 3 days in RMNP with a Kelty Trekker pack. 45lb pack weight didn't bother me to carry but was painful and clumsy to put on. Also sleeping was uncomfortable even on a 1.5" Thermarest Prolite Plus. I would suggest before surgery that you practice putting on your loaded pack without using your left shoulder much. I wish I had.